The Blue Train is an incomparable all-inclusive experience in unsurpassed luxury and the perfect way to see South Africa. Enjoy tantalising cuisine and take in the stunning scenery from elegant lounges. 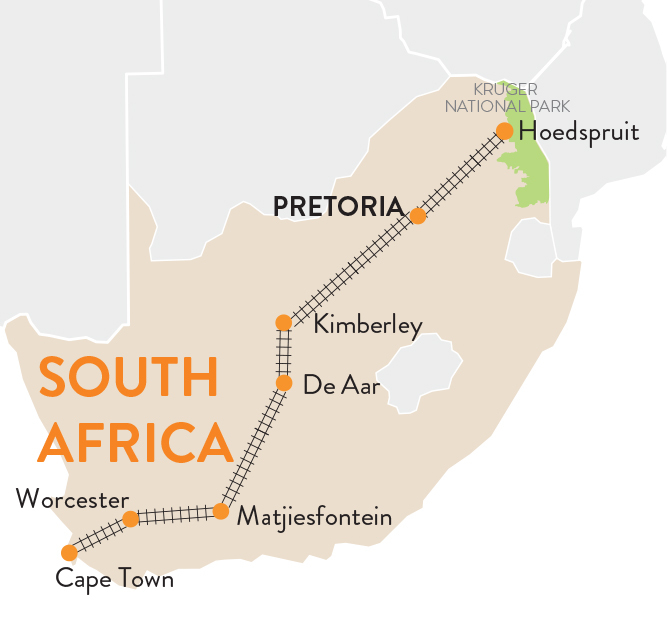 The route between Pretoria and Cape Town is a journey of over 1600 kilometres through some of the most diverse and spectacular scenery in southern Africa. On the southbound and northbound journey the train stops at Kimberley, where you will take a step a back in time to the days of the diamond rush. Visiting the Kimberley Open Mine Museum. Upon arriving back at the train you will be met with a glass of sherry, the glass is engraved and is your memento to keep of your journey. The train now also journeys between Pretoria and Hoedspruit. The Blue Train dining experience is an elegant affair and a banquet for all the senses. The meals are freshly prepared on board the train by executive chefs. Carefully selected South African wines complement the gourmet cuisine service. Each Blue Train suite has a fully appointed ensuite, featuring either a bath or a shower. All suites are equipped with telephone, television monitor, wi-fi access and individually controlled air-conditioning. Deluxe Suites are a choice of a twin-bedded suite with shower or a double bed suite with three-quarter size bath. Luxury Suites have a choice of twin beds or double bed and a full size bath with hand shower. Luxury suites are also equipped with CD and DVD player.